This post was sponsored by Better Bakery. All opinions are my own. When I say soup, you sandwich. Soup. SANDWICH! Soup. SANDWICH! Please tell me you acted that out as you read it. I can't be the only one who chanted loudly and pumped my arm in the air. Right? Well, even if I was the only one, I know tons of people who will agree with me when I say that soup and a sandwich as the perfect partners. Growing up, both of my parents would crank open a can of soup and heat it up on the stove while they made a line of sandwiches. I've always loved dunking my way through a crisp-on-the-outside, melty-on-the-inside grilled cheese. But my dad also loved making BLT's featuring thick-cut bacon and homemade mayonnaise, double-decker Club Sandwiches that I could barely fit in my mouth, and tall Reubens that stunk up the house in the best way possible. While I'd happily eat any of these sandwiches by themselves, having a cup of soup on the side just makes the meal seem complete. Much like my parents (especially dad), who lovingly put together those nutritious meals that we grew up on, Better Bakery takes pride in creating small-batch, handcrafted sandwiches. When they asked if I'd like to team up with them to create a side dish that would complement their sandwiches, guess where my mind immediately went? You guessed it—straight back to the simple, nourishing meal that I've loved since childhood. After reading that Better Bakery hand cuts, rolls, tops, and picks each of their artisan melts as part of their "Always Handcrafted" promise, I couldn't wait to try them for the first time. I found mine at Walmart, but they are available at several retailers (find one near you by checking out their product locator at the bottom of this page). They have two varieties of artisan melts, Cheese & Pepperoni Pizza and Chicken & Bacon Club. I was delighted at the look of them as they came out of the box. You can tell that they are hand rolled and cut, and the filling is visible all the way through to the end where it peeks out. I wanted to make a batch of soup that fit nicely alongside either variety of melt, so I chose tomato. Winter is actually a great time to make this soup from the fresh tomatoes (usually Romas) that you can find in the supermarket this time of year. 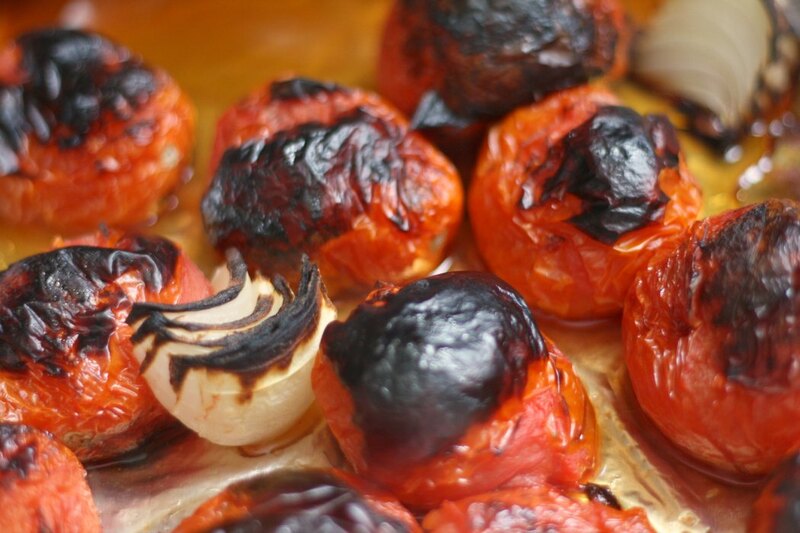 While you may not delight in slicing and eating them right now, charring them under the broiler actually concentrates the flavor of the tomatoes and adds an extra layer of flavor. While you could definitely season this with all sorts of spices or herbs, my favorite ones to add are smoked paprika and cumin; they enhance that rustic "char" factor beautifully. I also add ground annatto seed to intensify the color. The seeds are hard as rocks and really need to be ground to a fine powder before using. A spice grinder works well for the task, but I've been able to find ground annatto in the spice aisle lately, and that makes it simple to use. Seasoned this way, it makes a wonderful accompaniment to the Chicken & Bacon Club. I didn't think that the cumin would play well with the Cheese & Pepperoni though, so I made a batch without those three spices and swirled in some basil pesto as a nod to the Italian-lean of this melt. 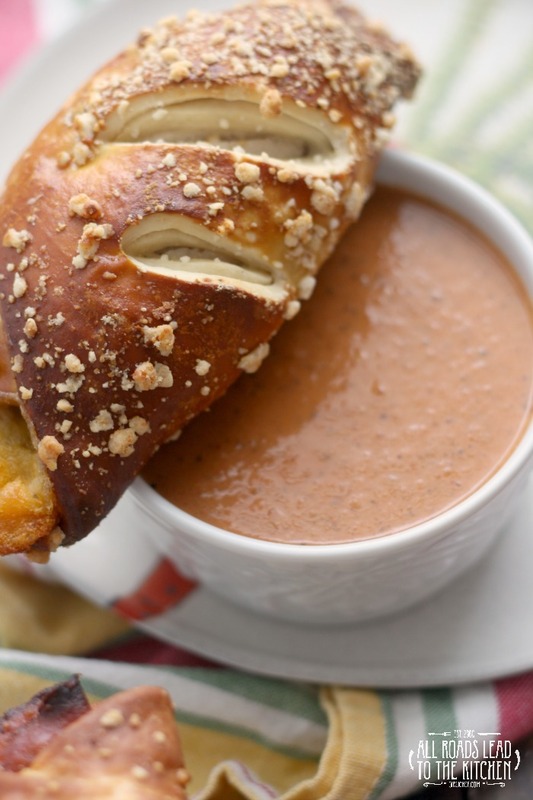 My family couldn't decide which way we liked the soup best, so it's nice to know that this is one we can come back to for years to come and simply switch up the seasonings to suit whatever type of sandwich we're serving alongside it! 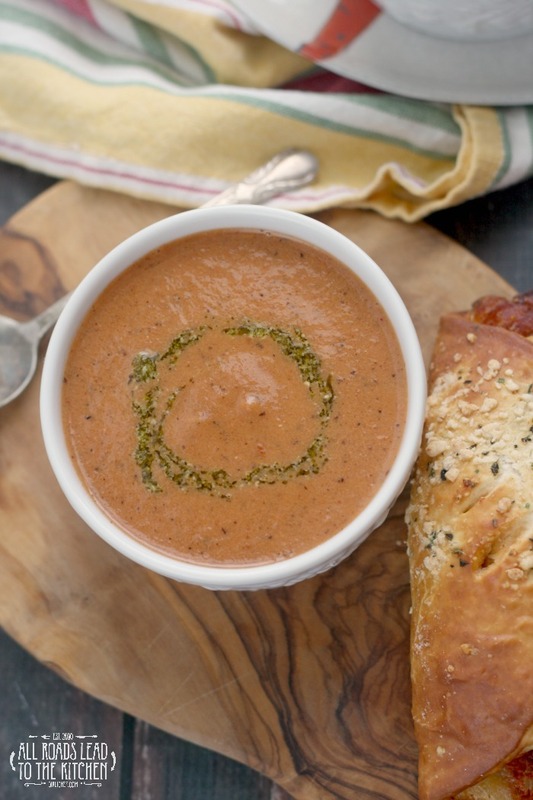 This warm, comforting charred tomato soup can be seasoned different ways to make the perfect accompaniment to any sandwich. Preheat the broiler. Line a small baking sheet with foil. Lay the tomatoes, onion, and garlic on the tray. Set under the broiler until charred on all sides, turning as needed, approximately 30 minutes (although this can vary depending on your oven). Also, remove the garlic once it has turned brown and soft (after about 8 minutes). Peel garlic and add it to pot with tomatoes, onions, and any juices. Add chicken broth, paprika, annatto, cumin, salt and pepper; bring to a boil. Reduce to a gentle simmer for 15 minutes. Transfer to the jar of a blender and puree until smooth. Set a medium-mesh strainer over the pot and pour the soup back in. Stir in the cream, taste and adjust seasoning with salt and pepper as needed. Leave out the smoked paprika, annatto, and cumin if you want to get rid of the smoky, southwest sort of flavor. 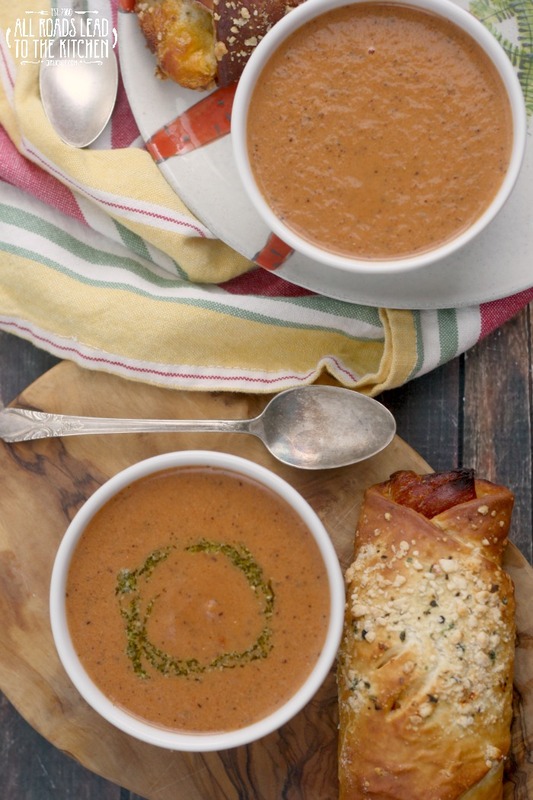 When ready to eat, serve with a tablespoon of pesto swirled into each serving. 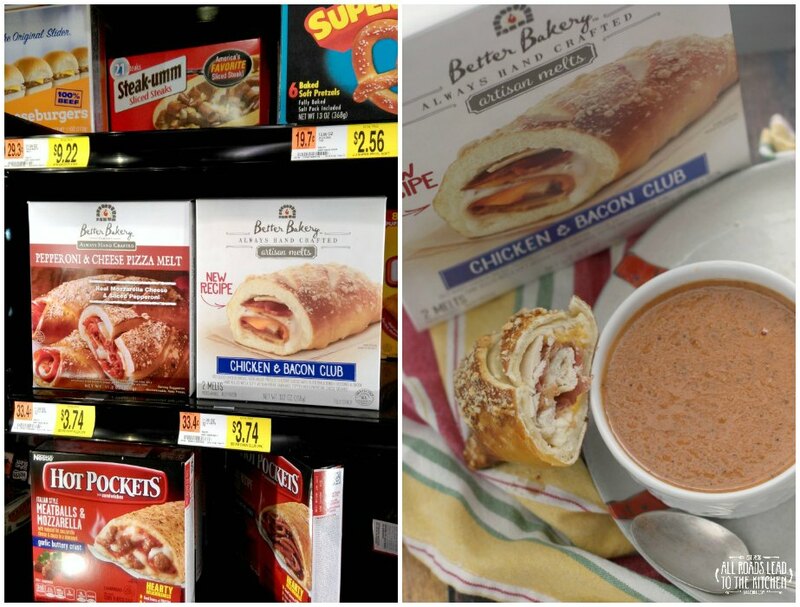 Click to find Better Bakery Artisan Melts at a store near you!